﻿Baptism: ﻿ For infant baptism, please call the church office at least 3 months prior to the birth of the child. Confession: Children are prepared to make their first confession in the School of Religion's second grade class. Contact﻿ ﻿﻿﻿﻿Jodi Fischer﻿﻿﻿ ﻿﻿for additional details, or check the ﻿﻿schedule﻿﻿ for regular confession times. Holy Eucharist: Children are prepared to make their first Holy Communion in the School of Religion's second grade class. Children must have at least one previous year of religious education and attend Mas on a regular basis prior to receiving sacraments. Contact Jodi Fischer for additional details, or check the schedule for regular mass times. If you are hospitalized, homebound or in a local nursing home, please contact the parish office to arrange to receive communion. 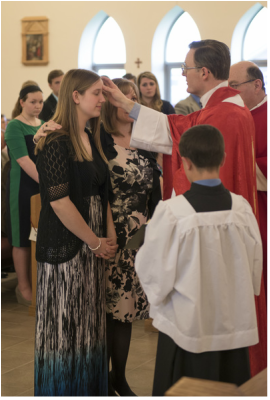 Additional guidelines on receiving the sacrament of Holy Communion can be found HERE. Confirmation: ﻿ High School Freshmen and Sophomores are eligible to be Confirmed. Contact ﻿﻿﻿Jodi Fischer ﻿for further information. Children must have at least one previous year of religious education and attend Mass on a regular basis prior to receiving sacraments. Adults interested in Confirmation or joining the church should contact ﻿Father Murphy﻿ for further information. Marriage: Because Holy Matrimony is a sacrament requiring jurisdiction, at least one party should be a registered member of the parish. To begin the marriage preparation process one must be a registered and active member of Our Lady of Lourdes Parish for a minimum of six months. Couples intending to marry should contact the parish as soon as there is an agreement to marry as at least nine (9) months is needed before the anticipated wedding to prepare for the Sacrament of Matrimony. Please contact Father Murphy for more information. Anointing of the Sick: The Sacrament of the Sick is available to all parishioners by request to the Parish Office on any occasion of serious illness-either at a hospital or in the home. A family should never delay requesting this sacrament which is for healing, In case of an accident or life threatening emergency which requires a priest, please CLICK HERE to download a bulletin which contains the emergency number. If you wish to receive the sacrament outside of an emergency, please contact Father Murphy. Holy Orders: For more information on discerning a vocation, please contact Father Murphy.